Ernest Jennings Ford (February 13, 1919 – October 17, 1991), known professionally as Tennessee Ernie Ford, was an American recording artist and television host who enjoyed success in the country and Western, pop, and gospel musical genres. Noted for his rich bass-baritone voice and down-home humor, he is remembered for his hit recordings of "The Shotgun Boogie" and "Sixteen Tons". Ford was born in Bristol, Tennessee, to Maud (née Long) and Clarence Thomas Ford. The 1940 census shows that he had an older brother named Stanley H. Ford. Ford eventually ended his KXLA morning show and in the early 1950s, moved on from Hometown Jamboree. He took over from band-leader Kay Kyser as host of the TV version of NBC quiz show College of Musical Knowledge when it returned briefly in 1954 after a four-year hiatus. 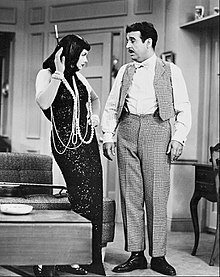 He became a household name in the U.S., largely as a result of his portrayal in 1954 of the 'country bumpkin', "Cousin Ernie", on three episodes of I Love Lucy. In 1955, Ford recorded "Davy Crockett, King of the Wild Frontier" (which reached number 4 on the country music chart) with "Farewell to the Mountains" on side B.
Ford subsequently hosted his own prime-time variety program, The Ford Show, which ran on NBC television from October 4, 1956, to June 29, 1961. Ford's last name allowed the show title to carry a unique double entendre by selling the naming rights to the Ford Motor Company (Ford had no known relation to the Ford family that founded that company). The Ford Theatre, an anthology series also sponsored by the company, had run in the same time slot on NBC in the preceding 1955–1956 season. Ford's program was notable for the inclusion of a religious song at the end of every show; Ford insisted on this despite objections from network officials who feared it might provoke controversy. Network officials stepped back when the hymn became the most popular segment of his show. He earned the nickname "The Ol' Pea-Picker" due to his catchphrase, "Bless your pea-pickin' heart!" He began using the term during his disc jockey days on KXLA. Out of the public eye, Ford and wife Betty contended with serious alcohol problems; Betty had had the problem since the 1950s as well as emotional issues that complicated both their lives and the lives of their sons. Though his drinking began to worsen in the 60s, he worked continuously, seemingly unaffected by his heavy intake of whiskey. By the 1970s, however, it had begun to take an increasing toll on his health, appearance and ability to sing, though his problems were not known publicly. After Betty's substance abuse-related death in 1989, Ernie's liver problems, diagnosed years earlier, became more apparent, but he refused to reduce his drinking despite repeated doctors' warnings. His last interview was taped in September 1991 by his long-time friend Dinah Shore for her TV show. Ford was married to Betty Heminger from September 18, 1942, until her death on February 26, 1989. They had two sons: Jeffrey Buckner "Buck" Ford (born January 6, 1950); and Brion Leonard Ford (born September 3, 1952, in San Gabriel, California), who died on October 24, 2008, in White House, Tennessee, of lung cancer at age 56. Less than four months after Betty's death, Ford married again. On September 28, 1991, he suffered severe liver failure at Dulles Airport, shortly after leaving a state dinner at the White House, hosted by then President George H. W. Bush. Ford died in H. C. A. Reston Hospital Center, in Reston, Virginia, on October 17. Ford was interred at Alta Mesa Memorial Park, Palo Alto, California. His second wife, Beverly Wood Ford (1921–2001), died 10 years after Ernie and her body was interred with his. This page is based on the Wikipedia article Tennessee Ernie Ford; it is used under the Creative Commons Attribution-ShareAlike 3.0 Unported License (CC-BY-SA). You may redistribute it, verbatim or modified, providing that you comply with the terms of the CC-BY-SA.